The documentary gives space to reflect on the Bhutanese democracy. The Bhutanese in the 2018 general elections voted a new government. This is the third new government since the introduction of democracy in 2008.While much of the electoral processes has been a peaceful one, experiences have also left many to think, debate, and reflect on the impact of democracy on people. 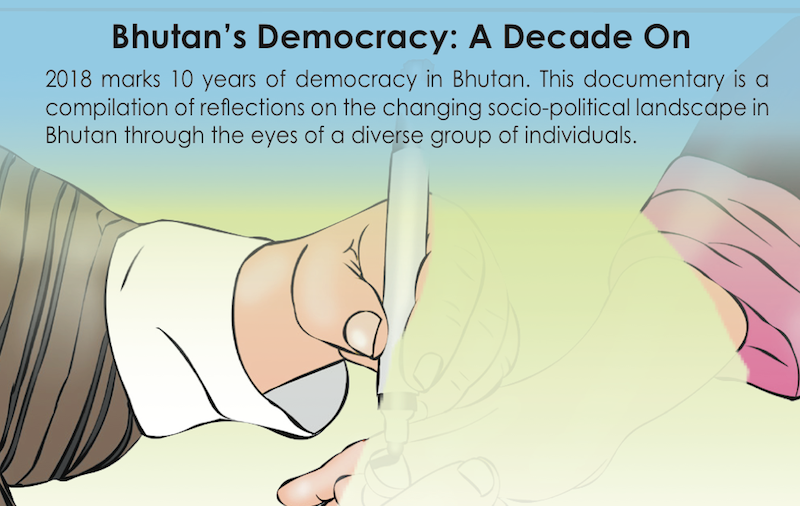 To give citizens, leaders, media, women, and youth a space to share their reflections, experiences, and views on Bhutan’s democracy, a 35-minute documentary on ‘Bhutan’s Democracy: A Decade On” is being produced. The documentary will feature experiences and reflections of diverse groups of people and identifies the main trends in elections. Political party leaders share their thoughts candidly alongside people across Bhutan. As the final edits are being made, BCMD is preparing to launch the documentary in February. 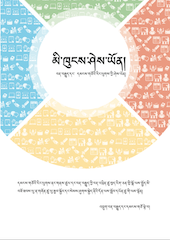 Look out for the announcement online if you would like a seat at the launch in Thimphu. The film is supported by CFLI. Youths learn to be a responsible citizen. Education level and plastic bag usage by Punakha Team. The five groups will present their position paper during the Summer YI Camp in July. The weeklong programme in January was aimed at awakening social consciousness. Youths learned about the responsibilities of being a citizen and the skills of inquiry to understand society in the year-long programme. “I feel like a week of awareness has opened my eyes to what is going on in the country. I am now equipped to take action,” said a YI participant, Tenzin Wangmo. Youths also saw opportunities for youth to engage at the local level with 50 percent of the budget in the 12 Five-Year-Plan allocated to the Local Government. This I was supported by CFLI. 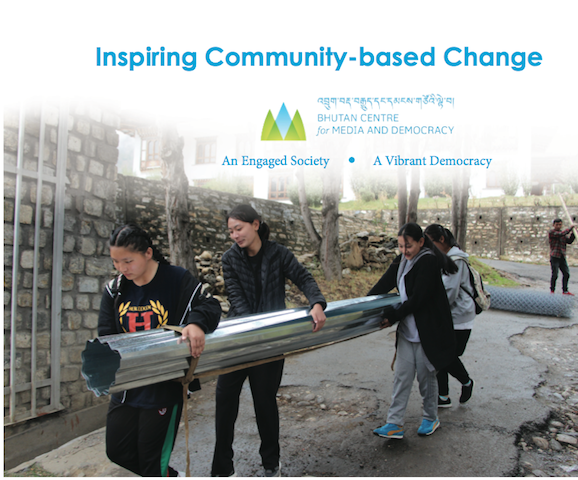 The impact of Local Action Plans of Community Building Initiative is now captured in a photo essay book ‘Inspiring Community-based Change’. Rikhay village. Improvement of road safety at Dewathang by its primary school students are also covered in the photo essay. We thank International International IDEA, CFLI, and UNDP for making the programme possible and look forward to continued support in the coming year. BCMD also acknowledges the contributions of CSOs based in Paro and Samdrup Jongkhar and town residents for listening to the youth proposals and sharing feedback.Our partner, the Samdrup Jongkhar Initiative and BCMD are looking forward to the next phase of the project. We welcome support for our initiative to enable us to reach more people in the coming year. The book captures the impacts of youth as an agent of change in communities. The same guidebook is also being converted into braille so that more persons with disabilities can learn news literacy. This is being done following a training last year to Special Education Needs teachers from Wangseland Muenseling Institutes. Both the guidebooks will be launched in February and will be distributed to villages, monastic institutes, and schools across the country to help everyone becomea smart consumer of information. The braille productions are being done in partnership with the Royal Education Council. 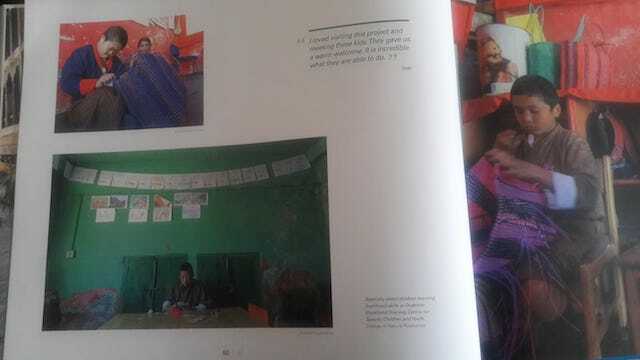 Pictures of adolescent photographers, Bhutan Centre for Media and Democracy (BCMD) trained in 2017 have been featured in UNICEF ROSA’s photo book ‘ThroughMyEyes’.The publication was released recently featuring at least 19 pictures taken by adolescents including monks and nuns, school-going, and out-of-school. We’re proud that photographs and creative works of the adolescents from Bhutan have been reproduced to share their stories of Bhutan. BCMD has conducted three workshops on photography in 2018 to enable youth and media officials from the Parliament to share their views through pictures. We thank UNICEF for supporting some of our Media Lab activities and our joint results in this stunning 24/30 CM fullcolour picture book. ‘ThroughMyEyes’ features photographs taken by the adolescent nuns, monks, and students.